If you are looking to build a successful business blog. I recommend that you learn from the person who has built so many successful blog with over 10 years experience with successful blogging. One of such people is Darren Rowse, the founder of Problogger! To help you get access to his teachings, here is a list of 6 Must Have Resources to Build a Successful Business Blog that Darren Rowse will also recommend you to get. Not only should you get them, you should read and learn from the resources. After which you need to pactice them in order for you to move your blog from where it is now to where you want it to be. If you are looking for resources to take your blog to help you create a successful blog – you are in the right place. In addition to the daily blog tips that Problogger has provided since 2004, Darren Rowse has also produced six great downloadable resources to help your blog reach its potential. 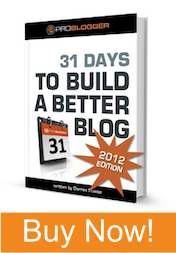 31 Days to Build a Better Blog has been downloaded by many thousands of bloggers and has been recently updated into a 2nd edition for 2012 discover more about this best-selling eBook here. Bloggers starting out quickly discover that there is a lot more to this medium than just setting up a blog and quickly slapping up a post or two. Your first post is just the beginning and you are then faced with the tasks of finding readers, coming up with more post ideas and thinking about the long-term strategy of your blog. 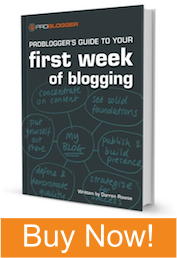 This eBook is jam-packed with practical activities and exercises to do in your first week to make sure your blog is heading in the right direction. This is one of the resources to build a successful business blog from the start. Practical tasks at the end of each of the 12 chapters let you implement Mark’s mentoring in a way that suits your business, and your customers. 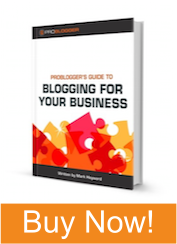 Learn more about ProBlogger’s Guide to Blogging for Your Business. If you have a blog and understand the basics but are struggling to find time, motivation or focus, Blog Wise is for you. One of the most common obstacles to successful blogging among our readers is simply finding time – so we sat down with 9 prolific and successful bloggers to find out how they not only blog successfully but balance that with busy work, family and social lives. 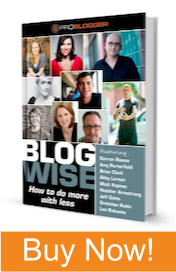 Bloggers interviewed include Heather Armstrong from Dooce, Brian Clark from CopyBlogger, Abby Larson from Style Me Pretty, Leo Babauta from Zen Habits, Gretchen Rubin from the Happiness Project, Darren Rowse from ProBlogger and Digital Photography School and more. These bloggers juggle a lot but they get things done and will give you insight into what it takes to run a successful blog but also how to use your time effectively. Learn More about this Powerful eBook here. Your blog posts are the cornerstone of your blog and will be the difference between you reaching your goals or not. This scorecard resource is designed to help you analyze the most important elements of your content to make sure they are engaging, readable, professional and optimized for search engines. It is the ideal resource for all bloggers who are just starting out and want to learn the basics of SEO or those who have been at it a while but want to grow their search engine traffic. 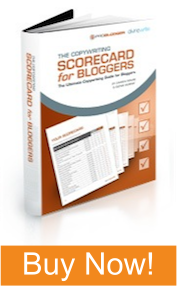 Discover more about the Copywriting Scorecard for Bloggers. The kit’s eBook is backed by an extensive library of practical templates, printable worksheets, and in-practice example documents, this kit delivers all you need to make your blog turn a profit now and over the long-term. 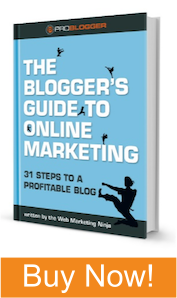 This kit was developed by experienced online marketer – Shayne Tilley (the Web Marketing Ninja).Discover more about the Blogger’s Guide to Online Marketing. If you have any issues with paying for the resources to build a successful business blog, please let me know. I’ll respond to you as soon as possible.